The Best Popcorn You Will Ever Eat! 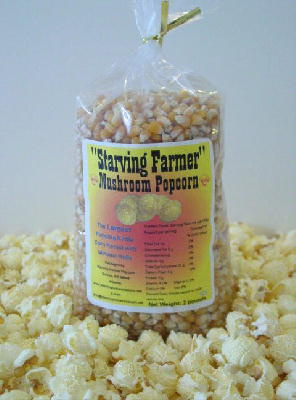 Welcome to "Starving Farmer" Popcorn, home of the best tasting popcorn you will find anywhere. Home Grown Popcorn from the Fertile Soils of the Columbia Basin in Washington State. All of our popcorn is GMO free and Gluten Free grown with no pesticides. We started growing this "Japanese White Hulless Popcorn" about fifteen years ago for our own use and found that it was by far the best popcorn we had ever eaten. We compared it to many hulless varieties and found the texture and nutty taste far superior to any other. Japanese Hulless popcorn is a smaller kernal corn with a very thin hull that makes it much more palatable than regular popcorn. South American Yellow Heirloom Mushroom Style Popcorn. A great natural mushroom and butterfly mix popcorn that has the flavor that has survived the test of time. An heirloom popcorn with a thin hull. 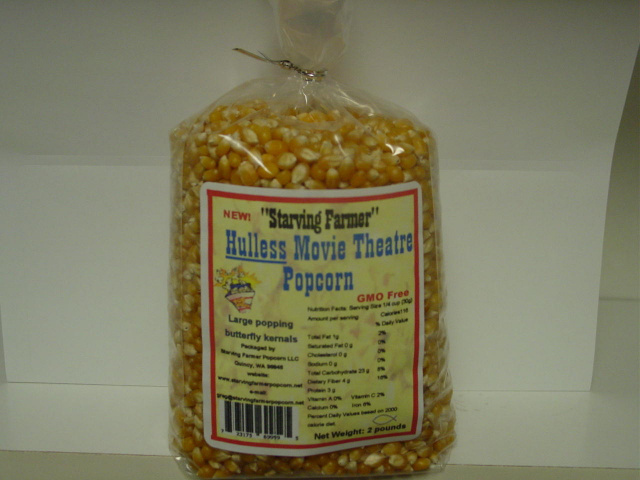 Works great for kettle corn and popcorn balls, or just pop and eat. Our Special "Kettle Korn" Kernel that will out pop everything. Almost 100% Mushroom Kernels with minimal hulls and 30% larger yield. You won't believe the size of these kernals. Our Mushroom Popcorn is GMO free. Great for Kettle Corn, popcorn balls or just pop it and eat it. Now you can have that great theatre popcorn taste right in your own home. A great tasting yellow popcorn with a thin hull. More flavor and easier to eat. We are happy to combine shipping on orders combining the different popcorn products up to 12 bags at the flat rate charge of $13.95. The shopping cart will do this automatically up to 12 bags. All orders of more than 12 bags will be charged additional shipping. 13 - 24 bags add $13.95, 25 - 36 bags add $27.90. Worldwide Shipping. Maximum order outside the United States is 8 bags due to USPS shipping weight limits on flat rate boxes. International Shipping please check rates. "Support The American Farmers who supply the highest quality and safest food in the World." Only you can protect America's food supply. Buy American products and God Bless America! Joel 2:19 Yea, the LORD will answer and say unto his people, Behold, I will send you corn, and wine, and oil, and ye shall be satisfied therewith: and I will no more make you a reproach among the heathen.